Clu is back with his second installment of the (College) Basketball Jones. He breaks down the happenings in college basketball during the last week. Wow what a week it has been for college hoops! I hope you were able to keep up with all of it. So here are all of the high scoring games, upsets, and last minute wins that happened over the course of this week. So sit back and enjoy! As mentioned in last week’s post, #12 Murray State (20-0, 8-0) now stands alone in the top 25 as the only undefeated team, as both top ranked Syracuse and Baylor lost their games on Saturday night. As I mentioned last week, Murray state should be able to cruise to a automatic bid into the NCAA tournament in the Ohio Valley conference. It will be interesting to see how both Syracuse and Baylor will bounce back from their losses on Saturday. 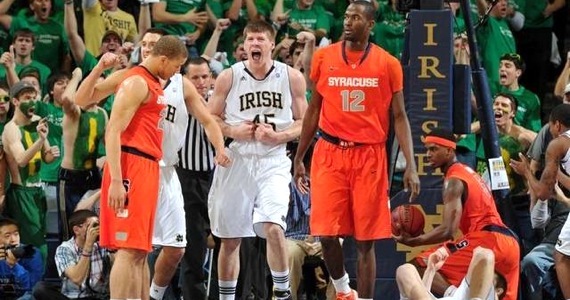 Syracuse, who was shocked in South Bend by the Fighting Irish 67-58, will now go to Cincinnati on Monday to face a depleted Bearcats team still trying to get a hold of themselves since their brawl with Xavier. Baylor, on the other hand must face a tough Oklahoma team on the road. can the Bears handle the Sooners? 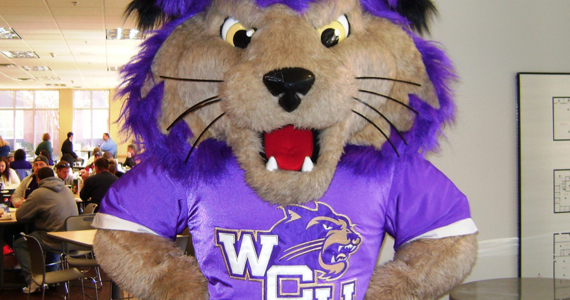 Thats right people, it’s not a typo… Earlier this week, the college of Western Carolina (that’s their mascot in the featured image) defeated the Toccoa Falls Eagles in a lopsided 141-39 win. 141 POINTS!!!!! I mean they led 72-17 at the end of the 1st half! Talk about running up the score a little bit huh?! They probably could have brought in the girls freshman club team to play the 2nd half, and still won the game! Also, Western Carolina broke its previous scoring high, which was set in a 133-58 victory over this same Toccoa Falls team back in 2001. Maybe Toccoa Falls should just cut their losses in basketball and move on to other sports? Perhaps Fencing? Or Water Polo maybe? What are they putting in the water down in Tallahassee Florida? Winning streak over… taste the happy. So in last weeks post, I talked about the major drubbing that took place down at Florida State University when the Seminoles thumped UNC. I didn’t think that I would be talking about them again this week because clearly that was just a one and done deal right? WRONG! 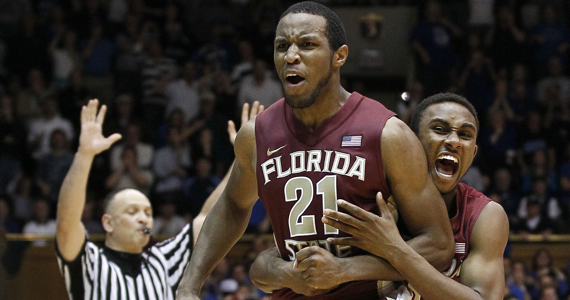 For the 2nd week in a row, Florida State has shocked the basketball world. This time, they beat #4 ranked Duke University, at Duke, at Coach K. Court 76-73. This week, the hero was Junior Guard Michael Snaer, who hit a 3-pointer as time expired to beat the Blue Devils on Saturday. Snaer’s thrilling buzzer-beater snapped Duke’s 45-game home winning streak, and gave the Seminoles a four game winning streak. So… can someone please give them some love when it comes time for the new rankings this week? Michigan denied Michigan state, and may have rekindled the rivalry. In recent history, not much has been said about the Michigan/Michigan State basketball rivalry because the Spartans have dominated the Wolverines in 18 of their last 21 meetings. This time, however, for the 1st time since 1998, both teams were ranked nationally for their meeting, and set for a blood bath. In the end, #20 Michigan beat #9 Michigan State 60-59 on a Stu Douglas Layup with 35.6 seconds remaining. This weekend, Michigan lost to Arkansas, and Michigan State defeated Purdue. The two rivals will meet again on Sunday, February 5th in what should be a big re-match for the Spartans. Apparently, it was 70s night in Tennessee. Usually when we talk about UCONN and Tennessee in the same sentence, it means we are either talking about Pat Summit and the Lady Volunteers, the Lady Huskies, and probably the two teams meeting in the NCAA Womens Basketball championship. This past Saturday, however, the men’s teams battled against one another. Wouldn’t you know it, the Volunteers shocked the Huskies 60-57! It didnt help that UCONN missed their first five shots of the 2nd half (which could have helped set the tempo for the Huskies). I guess it’s back to the drawing board for UCONN, as they have now lost two games in a row (both heartbreakers), and will have another tough task when they face Notre Dame next week at home. As for the Vols, they’re just happy with the win as they try to rebuild a program that was given a black eye with the Bruce Pearl scandal from last year.